hat if you could push a magic button and suddenly have a massive landslide of targeted visitors rushing to your web site and whipping out their credit cards to buy your product or service on the spot? In a perfect world, maybe... but unfortunately this "magic" solution doesn't exist. Yet, that's exactly what the majority of people are still looking for... that one-button-does-all solution to end their web site woes forever and make them rich, famous and even better looking. "Get Rich in 30 Days without Even Trying!" 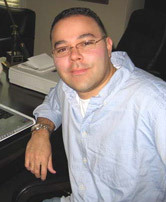 "Slam Your Web Site with 50,000 Visitors in Only 10 Days!" "Give Me 6 Weeks And I'll Make You A Multi-Millionaire!" Most copywriters are actually taught to sell the "magic pill" that instantly and effortlessly cures all the prospects' problems and provides a one-size-fits-all solution to reach their dreams. However, aren't you getting just a bit tired of guaranteed results that deliver almost nothing in the end? Which of These List Building Methods Are Wasting Most of Your Time and Money? Classified Advertising - Once a golden ticket for bringing in tons of fresh, new subscribers and sales, promoting your products in online classifieds isn't near as profitable because the level of ads competing for your prospect's attention is suffocating and leaves them un-reached. Ezine Advertising - Blasting your ad across thousands of online publications used to draw in new subscribers by the boatload, but now most readers simply ignore the ads while scanning the issues for content. Pay Per Click - For those with deep pockets, paying for every visitor to your web site may seem like a good idea. But this method can take many hours of hard testing and thousands of dollars just to break even. Link Exchanges - In the old days of internet marketing, the number of quality links you had pointing to your web site determined how many visitors, subscribers and sales you could expect. However, although links still hold great value to the search engines, the time required to generate the number of links you need to rank high is a full-time job unto itself. Writing Articles - This could be one of the best methods to generate steady streams of responsive traffic and subscribers, only it takes either an unreasonable amount of time or money to get these lead generation magnets submitted and ranking high enough in the search engines and directories to see a considerable difference. Co-Registration - If you're a seasoned professional copywriter, email marketer and advertising specialist, co-registration can prove to be a powerful ally... however, miss any one of these crucial elements and it could put you out of business and filing for bankruptcy! Two well-known juggernauts of marketing actually used the very tool I'm about to reveal to come in 2nd place in the affiliate contest for a giant $897 per month Training Program that launched not too long ago! The method I'm speaking of is called word of mouth advertising. is none other than the Viral Friend Generator. Viral Friend Generator is the next evolution in tell-a-friend technology. In less than five minutes (the time it takes you to fill in the form and upload to your server)... you can literally multiply the number of visitors and subscribers your web site receives by as much as 300% or higher! "Your 'Viral Friend Generator' software is my new secret weapon for building my list much more rapidly. It's definitely one of the most effective software products to hit the market this year. I love how it creates a reward system for you that allows your existing visitors and readers to grow your list FOR you, without having to lift a finger. "Wow! Viral Friend Generator is a killer program. You have put together an absolutely necessary resource for all marketers. No more clunky PHP scripts to install and test. With VFG it's just copy and paste. The ability to track how many visitors are referring friends is just brilliant. Also, the options for VFG are endless, but using VFG is as easy as Step-By-Step. Giving your vistors free gifts for referring a certain number of people is what sets VFG apart from other Tell-A-Friend scripts. When we launched our latest campaign incorporating VFG was a no-brainer. As with anything you release, the quality is impeccable and the software is easy to use. Adding VFG to your arsenal will only increase your bottom line and leverage your online marketing efforts. 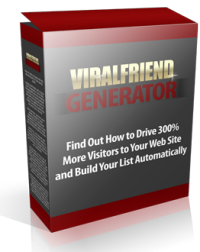 Viral Friend Generator is a must-have for any internet marketer." You might be wondering how this is possible. For example, let's say that every visitor to your web site is worth ten cents. You download and install a copy of Viral Friend Generator to your site, take five minutes to fill in the user friendly form and upload the html code you're given to your web site. Now, instead of making ten cents for every visitor on average, you're instantly making thirty cents per visitor! This happens because Viral Friend Generator is working in the background and rewarding your visitors for getting new referrals to visit your web site. Unlike any other tell-a-friend software, the Viral Friend Generator gives you the ability to require those who submit referrals to actually persuade their friends to visit and even join your list of subscribers in order to be rewarded with your free offer! You choose the amount of friends you want each visitor to enter into the form before they can gain access to your product. For instance, you can have visitors tell three friends to download a report, or even ten friends to win free tickets to a teleseminar! The user-friendly control panel allows you to easily access and manage all of your Viral Friend Generator campaigns across all your web sites at a glance in one central location. Never feel cheated on friend submissions again! You can set a minimum number of friends required for your visitor to gain access to your product. If the visitor doesn’t fill in the required amount of friends, they’ll get a warning telling them to refer more friends before they can get access to receive your product. Track the number of people who tell their friends and even the number of friends who click the link inside the referral email to join your site! You can also see valuable statistics for each campaign, including your conversions of visitors to subscribers. You can use our pre-written email to tell your visitors’ friends about your web site, or write your own. Additionally, your visitors can edit the pre-written email and inject their own voice and personality into each message. Keep your list clean by adding a “do not mail me again” link to the end of the welcome message your subscribers get after submitting the form… This ensures people who do not want to receive messages will never be added or sent an email from your server again. Redirect your visitors to any web page you want after successfully completing the form – this could be your sales page, an affiliate link or access to download your free product! The sender receives a confirmation email after they submit your form, giving them peace of mind in knowing their submission was successful and their download is on the way. The sender can also be notified every time one of their friends clicks on a link inside an email. You get full statistics of each visitor’s activity from inside your control panel so you'll know every action your visitors are taking on your web site, including their friends! Change another option to reward only those senders who get their friends to subscribe to your list and you've just multiplied your subscribers! Sure, this may turn off some visitors (what doesn't) but the end result is that your conversion of visitors-to-subscribers will skyrocket and the amount of actual subscribers you receive is dramatically increased! So in our example, your thirty cents per visitor has just taken you from $10.00 per one hundred subscribers all the way up to $30.00 with this one simple adjustment to your web site... and it happens overnight because Viral Friend Generator automatically leverages the traffic you're already getting and multiplies it by as much as 300% or higher! Download and install Viral Friend Generator to your web site. Give it an honest try, and if it doesn't increase the amount of visitors and subscribers to your web site by at least 300%, email me within 60 days and receive a complete refund... no questions asked. I'm absolutely positive you'll be so thrilled with your new ability to generate however many subscribers you want using the Viral Friend Generator that I'm standing firmly behind this product and my promise, or your money back! If you were to hire a top marketing consultant to increase your bottom line profits, it'd probably cost you around $1,000 - $10,000 or more, plus a certain percentage of your increased profits would go straight into his or her pocket each and every month. Let's say you bought tickets to a seminar that promised to teach you ways to increase the conversions on your web site, thereby maximizing every dollar per visitor and minimizing your advertising costs. That's a wonderful thing to know, but that knowledge would cost you around $597 - $2997. Or what if you purchased the platinum-level in every third party list building program that gave you the ability to mail out to tens of thousands of prospects every few days... just one of them would easily cost you $197 or more for the privilege and those subscribers still don't know you. It takes a lot of work to get them to become responsive and that doesn't guarantee you any sales! You could continue to utilize the power of squeeze pages to generate leads for your internet business, but the most you'd be generating is one lead at a time. With the Viral Friend Generator, you can explode the power of any squeeze page and instantly generate 300% more leads while using the same amount of traffic you've got coming to your web site right now! Absolute Top Five Viral Tell-A-Friend Internet Marketing Myths Exposed! Absolute Myth #1 - "Tell-A-Friend software is old and outdated technology, and doesn't work anymore." Absolute Myth #2 - "Someone could get a virus or trojan planted in their system using Tell-A-Friend software!" FACT: Many people who don't know any better have a pre-conceived idea that "viral marketing" has something to do with viruses and thereby miss out on one of the most powerful methods of marketing ever discovered. It is impossible to receive or send a virus or trojan using Viral Friend Generator. Absolute Myth #3 - "After submitting the names and emails of your friends and colleagues, you're subjecting them to a lifetime of email spam and follow-up sales messages." FACT: Your friends and colleagues' names and email addresses are never added to any mailing list and can never receive follow up messages. Viral Friend Generator only adds the sender's name and email to the mailing list at their request, which they must confirm in order to be added. Absolute Myth #4 - "You could get a spam complaint for sending Tell-A-Friend messages from your site." FACT: Anyone sending email can get a spam complaint. But Viral Friend Generator automatically keeps you in the clear because every message sent from your web site is personal one-to-one communication between the sender and his or her friend or colleague. This means no mass mailing is involved. Sidenote: I have personally used tell-a-friend technology over one hundred thousand times and have never once received a spam complaint through them. Absolute Myth #5 - "It's too easy to get cheated with Tell-A-Friend software." FACT: Actually, this myth is true. The visitor can get whatever bonus is being offered simply by inserting a bunch of bogus emails. But that's also what sets Viral Friend Generator lightyears ahead of ordinary Tell-A-Friend software. With Viral Friend Generator this problem is completely eliminated because the senders' friends and colleagues are required to visit your web site before they can be credited and sent the email to download your free bonus! Viral Friend Generator guarantees that your bonus offer remains protected and only available to legitimate prospects who tell real friends and colleagues about your offer, keeping your list clean and responsive to serious potential buyers! Using the Viral Friend Generator, you'd now instantly be averaging as much as 300% more visitors and subscribers, which brings you up to $1.41 per visitor -- now you're generating an average of $141 for every hundred subscribers! What's amazing is that every new subscriber also generates as much as 300% more visitors and subscribers for you on complete autopilot... when three subscribers each tell three of their friends and those friends become subscribers you're potentially looking at an instant increase of $423 in profits! Viral Friend Generator can be used on any web site offering a free product in exchange for some kind of action. Normally, you'd entice your visitors by offering them a free report in exchange for their first name and email address, but now you can also reward them with an additional bonus for telling a few friends about your site and getting them to sign up now. The possibilities are endless and the your potential to generate real, interested subscribers using Viral Friend Generator is only limited to your imagination... Try it today... Take five minutes of your time to fill in the form to tell the software how you want it to work, and upload it to your web site. Then watch Viral Friend Generator increase your visitors and subscribers by as much as 300% or more, overnight. Guaranteed! Take action now and download your copy of Viral Friend Generator to harness the virtually untapped power of word of mouth viral marketing on the internet and let your visitors do the advertising for you. You'll be astonished at the results. And that's a promise. Install One time, use on thousands of sites. Create Campaigns on the fly. Prevents Reward Gift access from fake emails. Does not deliver Reward Gift on Thank You page to fake email users. Has Tracking of friends that actually join. Has Reward option of only providing gifts to members that join. Has Captcha (Ay3G5) Image Coding to prevent email flooding of 1000 emails per minute by hacker robots that can get you caught in spam complaints and will crash your server. Has Detect FAKE DOMAIN email to prevent xsdwe@wwesdswe.com from being used. Allows you and Admin login panel to create, edit, and manage all of your campaigns and view stats any time you like. Admin Panel allows you to create campaigns in easy wizard and not some clunky CGI text files on with notepad. Adds Un subs to Do Not Send List. Has Ban Email from being sent to feature. Optional - Works with most popular auto responders like 1Shoppingcart, Get Response, Auto Response Plus to allow you to have names of sender added to your Auto responder. Allows you to earn commissions with multiple Branded viral features. Quality Product - Not a Cheap "wanna" be buggy clone that does not work, admittedly offers no support, and has 1/100th the features. The Only Profession tool of its kind used by the top marketers on the internet. Has proven results and case studies. YES Anders, I Want to Increase My Subscribers By 300% or More Today with the New Viral Friend Generator! I am ready to start getting as much as three-times more traffic, subscribers and sales than with any other method! I want to gain instant access to download the software and install it to my server using your simple "how to" video! I completely understand my 300% Total Satisfaction or My Money Back Guarantee, where I can give this software my best shot and if it doesn't give the results promised, I can get my money back! I totally agree that this is the biggest "no brainer" ever offered and I want to download my software right now! To conclude, please let me access this incredibly low one-time investment of only $97 for this ground breaking new viral marketing software. Give me access immediately! You Install Just One Time... Use on Hundreds of Your Other Domains. To Your Viral Marketing Success! P.S. Remember, this is the introductory price of this software. After the introductory period is over (that could be this week or even today,) we may raise the price to the normal price of $97 so make sure to lock in the lowest price ever by downloading today! P.P.S. Beware of cheap imitations with zero support. There is only 1 Real Viral Friend Generator. No one has a members forum like ours and no one is as committed to customer satisfaction as we are. We are the only tool in the world like this with proven success stories and we are committed to constantly improving our software. The reason none of the imitations work is none of them have the one secret function of automation that you find in VFG that is the secret to some of our users making thousands of dollars the very first day they start using it. Don't use any other tool... Leave the cheap knock offs for your competitors while you rake in all the profits! P.P.P.S. Keep in mind, if the Viral Friend Generator doesn't skyrocket your visitors and subscribers by as much as 300% or more, you can take our challenge for the 300% Total Satisfaction or Your Money Back, No questions asked Guarantee -- that's how completely convinced I am that this software will work for you! You have no risk so download now. 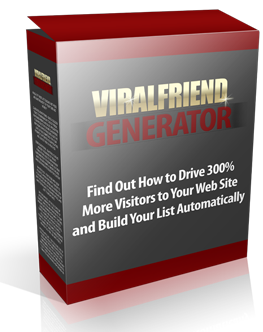 Get Your Copy of Viral Friend Generator and Boost Your Subscribers By As Much As 300% Overnight!